From the author of Cracked Up to Be and Some Girls Are comes a gripping story�about one girl�s search for clues into the mysterious death of her father.�When Eddie Reeves�s father commits suicide her life is consumed by the nagging question of why? Why when he was a legendary photographer and a brilliant teacher?�Why when he seemed to find inspiration in everything he saw? And, most important, why when�he had a daughter�who�loved him more than anyone else in the world?�When she meets Culler Evans,�a former student of her father�s and a photographer himself, an instant and dangerous�attraction begins.�Culler seems to know more about her father than she does and could possibly hold the key to the mystery surrounding his death.�But Eddie�s vulnerability has weakened her and Culler Evans is getting too close.�Her need for�the truth�keeps her hanging on...but are some questions better left unanswered? If anything, Courtney Summers can write an almost magically compelling book. Her novels are like train wrecks (not the writing, that part is excellent), no matter how hard it is to see, it’s impossible to look away. Fall For Anything is Summer’s latest novel and another book that just bows me over with it’s raw emotion. 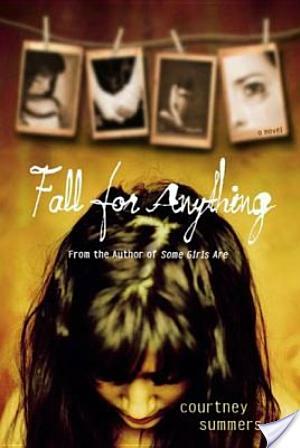 Fall For Anything follows Eddie Reeve, a girl who’s father committed suicide. Eddie feels no closure. One can see how painful it is for her to deal with the tragedy. By chance, she meets Culler Evers who studied under her father. Together they come across clues to closure and answer the question of why? Although I prefer Some Girls Are to Fall For Anything, this novel is nothing to sneeze at. As per usual there is complex characterization. From the popular girl has-been Beth, to the best friend with potential for more Milo, to fucked-up with her pain Eddie, to compelling creeper Culler Evans, Summers does a fine job in creating fictional people who might as well be real. There are little moments in Fall For Anything that I can relate t0, although I’ve never experience that type of tragedy. I think what this novel does very well is capture the agony of being a teen who has no real answers to life’s bigger questions. They are crazy addicting books, aren’t they? Glad you liked it. They are super addicting. Impossible to put down, I find. Glad you liked the book! I’ve been wanting to read this on for a while now! You should hurry and read it. I bet you will enjoy it. Well, it’s still good, but I just couldn’t relate to it on the same level as I did for Some Girls Are. I love this book, and agree that the characterisation is really complex – brilliantly so. I honestly can’t remember the last time a character p*ssed me off as much as Beth does – good intentions or not, every time she opened her mouth I wished Eddie would tell her where to go. If you liked Some Girls Are *more* than this one, it must be incredible. I loved this novel … but I agree, Some Girls Are is an amazing read! Great review!